Are There Herbal Treatments for Pulmonary Fibrosis? Cellulite--pockets of dimpled fat that usually appear on your thighs, buttocks, hips and waist--can be difficult to lose. Many women turn to Indian Ayurvedic herbs in an attempt to banish cellulite. Ayurveda, an ancient healing system that originated in India, identifies cellulite as vasa--fat tissue containing toxins, or ama. Ayurvedic practitioners treat cellulite by prescribing foods and herbs that have meda agni--or fiery--qualities that help boost body metabolism. Herbs can have side effects and interfere with prescription medications, so consult your doctor before using them. Gotu kola--botanically known as Centella asiatica, and also called Indian pennywort--is a perennial tropical herb. Ayurvedic healers believe gotu kola has strengthening, revitalizing and rejuvenating properties, and can promote longevity. According to Ayurveda Herbal Remedy, gotu kola helps repair connective tissue, which can help reduce the appearance of cellulite. Ayurvedic healers employ gotu kola to fight cellulite by using it in udvartana massage, in which herbs or grains are ground to a paste and applied to the body to cleanse skin, improve circulation and promote weight loss. 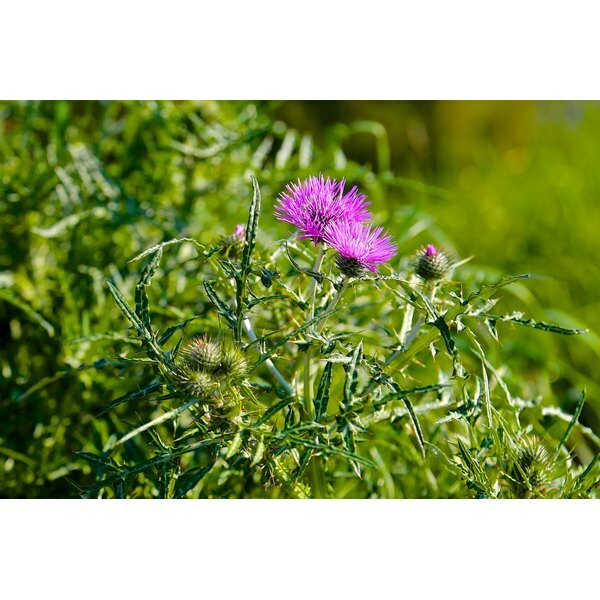 Milk thistle, or Silybum marianum, is a flowering herb that has been used for thousands of years for liver problems. An ingredient called silymarin, an antioxidant, is believed to be the biologically active part of the herb, which herbalists credit with liver-protective and detoxifying abilities. Ayurvedic practitioners consider the liver to be the seat of fire in the body, and advise milk thistle to help reduce cellulite by improving liver function, metabolism and circulation. In a clinical study conducted at the Bronx Veterans Association Medical Center in New York City and published in the October 2003 issue of Journal of Clinical Gastroenterology, researchers found that silymarin slowed the progression of alcohol-induced liver fibrosis in baboons. Ginger, or Zingiber officinale, is called nagar in Ayurveda, where it&#039;s used as a spice and an herbal medicine. Its anti-inflammatory and circulation-promoting properties make it a popular Indian herbal remedy for cellulite. According to Ayurvedic Guide, ginger increases agni, or digestive fire. Ayurvedic Herbal Remedy recommends steeping 1/4 tsp. dry ginger, 1/4 tsp. dill seed, 1/4 tsp. fenugreek seed and a clove in 8 oz. boiling water for five minutes, then drinking it to combat cellulite. Tulsi--botanically known as Ocimum sanctum, and also called holy basil--is a sacred plant in the Hindu religion. In Ayurveda, it&#039;s considered a rasayana, an herb that contributes to perfect health and promotes long life. Mountain Rose Herbs says this highly revered plant has been dubbed "Queen of Herbs" and "The Elixir of Life." According to Ayruvedic Cure, tulsi has laghu--light--and ruksh--dry--properties, which makes it helpful in curbing fat. Indian herbalists credit holy basil with anti-inflammatory properties, and there is some scientific research supporting this belief. In a clinical study conducted at Sardar Patel Medical College in India and published in the November 1987 issue of the Journal of Ethnopharmacology, researchers found that Ocimum sanctum inhibited acute and chronic inflammation in rats.